It’s one of the “core” exercises that any personal trainer worth his salt will encourage. In short, squatting is something which can make or break your routine – it taps into so many different muscles that leaving it out is simply not an option. Unfortunately, and this is probably because it is so effective, it’s also very difficult. Sure, you might start out with the bar and make a steady bit of progress, but as time progresses a lot of people find it increasingly difficult to squat any heavier weights. 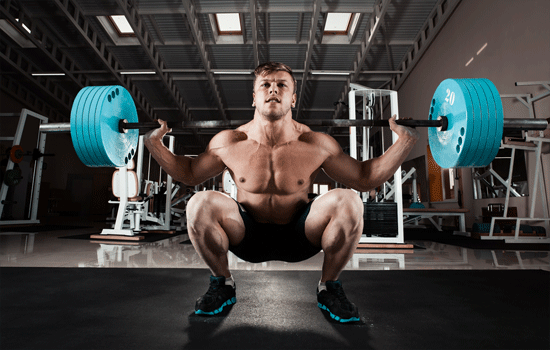 Following on from the above, if you have reached (or fear reaching) squatting plateau, here are some methods that you can use to develop the exercise. One of the most common reasons why you won’t be able to make any reasonable progress with your squatting is because your stance is just too narrow. Because of this, it’s very hard to squat parallel, while perhaps more importantly you won’t be able to use your groin muscles. The latter means that you won’t be able to use nearly as much weight as you would if your stance was wider. So, what constitutes a wider stance? We’re by no means saying that you should attempt the splits, but if you can make your heels shoulder-width apart you should be good to go. Another common mistake is that you just bend through your knees. Instead, you should effectively be sitting down, meaning that your knees travel forward. At the same time, your hips move back and as a result the whole exercise is much easier on your knees (and allows you to squat more at the same time). We should also provide something of a caveat when we talk about sitting back. Your knees should always bend through the movement, the difference is that your hips will be moving back. How do you know that you have sat back enough? Most guys will find that their hamstrings are really sore the next day – so this is a good indicator. The bar position is absolutely crucial whilst squatting and get this wrong, and the whole exercise can be in tatters. There’s a couple of points to look at here. Firstly, the bar itself should be on the lower part of your upper-back, which will immediately boost the amount you can lift. Under no circumstances should it be high on your traps – this will just make the exercise a whole lot harder. The second point we’re going to talk about is a sissy pad. While these might make your shoulders feel a little better during the exercise, in the long-term they will be hindering your progress significantly. This isn’t because you need to “toughen up” by not using one of these devices, it’s because they tinker with the position of the bar. It means that the bar is higher and there is less leverage, which obviously minimizes the impact of the workout. Additionally, it doesn’t matter how much you lift, you should never need to turn to a sissy pad – there’s no weight threshold by any stretch. We’ve touched upon the importance of knees through this exercise in previous sections, but let’s return to the subject. 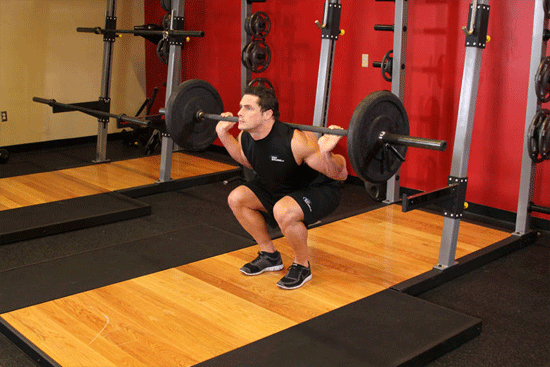 A common mistake seen at the gym is that the knees buckle as you go back up from the squat. Not only is this movement dangerous for your knees as it involves twisting, it can also hinder the effectiveness of the squat itself. This is again related to the groin and by following this mistake, you won’t be activating it (and therefore not lifting as much weight). There’s quite a degree of willpower required to succeed at this one, so we’ll leave the rest to you. Some guys will turn to a mini-band and place it around their knees but really, it’s all about consciously keeping track of your knees as you return to the upright position. Something that’s commonly seen at the gym is the guy who has racked up endless weights onto the bar, only to then proceed to perform half squats. In other words, he’s barely bending his knees – and this isn’t going to do him any good in the slightest. Instead of the above, simply make sure that you go parallel to the floor. Sure, you might not be able to rack quite as much weight as the half-squat, but the results will be double for sure. Over the last few years something that has been creeping into a lot of workouts is pause squats. In simple terms, these refer to squats where you pause for several seconds at the bottom of the exercise – before carrying on as normal. Many believe that the benefits to this form of the exercise are endless, and are crucial if you are serious about lifting bigger weights. You will immediately start to feel areas like your hips, hamstrings and glutes in overdrive. Following on from the above, let’s not forget about the old saying “practice makes perfect”. It’s one of the most annoying clichés out there, but when it comes to squatting its completely true. The most serious bodybuilders in the land make squatting a habit – it’s incorporated into several of their workouts every single week. As we’ve already spoken about, this is mainly because it takes into account so many muscles and is regarded as one of the core exercises. There’s another reason though – improved form helps you squat more weight. 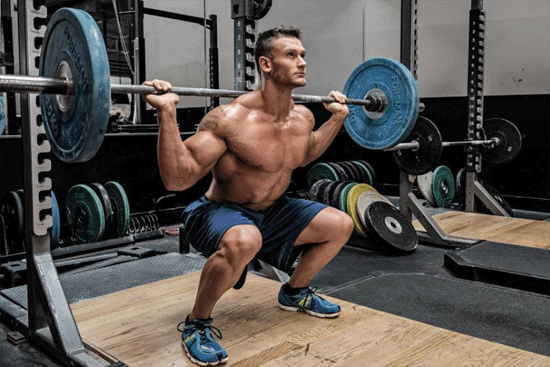 The more you practice, the more likely you are to see this perfect form occur – and it’s only at this point that you can really start to take advantage of squats. Unfortunately, it’s never going to get easier. 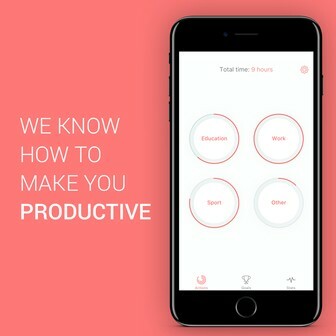 As you start to perfect your technique, there’s every chance that it is going to get more beneficial though – and that’s what we’re all craving.